Here’s a little something to commemorate your first run in with lice. It is a quick sketch inspired by your Lola. When I told her you boys had lice, she immediately said, “Aguy, dili gyod nako malimtan si Manang Aling!” (Oh, I will never forget Manang Aling!”) And so here she is, Manang Aling, resurrected from your Lola’s childhood memories. Once upon a time, there was an old woman, a spinster, who lived in her big house with her faithful maid. The old widow’s name was Aling and her faithful maid was Flor. Aling would peer through the wooden window slats and see a crowd of eager boys and girls, each clutching an envelope, elbowing each other for space in front of her locked iron gate. She would count 12 children. She would do a quick calculation and conclude that she would probably be getting 120. She would smile in anticipation. Flor would nod. She had done this before, many times, and knew the drill. At the sight of Flor, the children would grow more raucous, each wanting to go first. “Ok, everybody, no need to crowd and fight. You know the rules. You know you will all get your turn. Now, little ones first. Maria, come here,” Flor would say, motioning to the snot nosed four year old. Maria would step up. She would hand Flor her envelope. “I have 8,” she would say and hold out her palm for her pay. Without bothering to count, Flor would give her 8 shiny 25 centavo coins. She had been doing this enough to know that Aling didn’t have a way of verifying the numbers and, more importantly, did not really care. Another girl, slightly taller but just as dusty and scrappy as the rest of the group, would follow after Maria. “I have 20,” she would say, a little too loudly. Flor would look at the girl’s wide unblinking eyes and the fierce thrust of her chin. She would smile and tell the girl, “If you say so.” The girl would exhale and return a lopsided smile. Flor would know there were not twenty but she would also know that the girl’s parents expected 5.00 and anything less than that would earn the girl a heavy spanking with the rubber slipper or pinches right where they hurt most, along her crotch. She would give the girl two extra 25 centavo coins. One by one, each child would step up, hand her their envelopes, and leave with coins and bills crammed in their dirty fists. Before heading home to hand over their hard earned money to their parents, the children would look for Manong Billy, the Chinese siopao seller. Manong Billy would have already parked at the street corner, his tins full of freshly steamed pork buns. Like everyone in the neighborhood, he would know what Saturday meant. After enjoying their siopao with Coke in a plastic bag, the children would go back to their respective homes. After that, they would meet again for their dirty and sweaty juvenile games until dark. When their parents would protest at how late they stayed out, especially the girls, they would say, “We’re growing some more for Manang Aling. Don’t you want that?” And because they did, the parents would shut up. Flor would gather all the envelopes and return to Aling’s bedroom. “How many did you get? Are they big? Are they fat and full?” Aling would ask, clapping her hands in glee. Flor would bring out a fine toothed comb, a bottle of coconut oil, and white towel. She would sit on Aling’s bed. She would wonder how it would be like to sleep on cushion, surrounded with scented pillows and blankets, instead of on mats and bamboo floors, all the rest of her life. With a sigh, Aling would rest her head on Flor’s lap. Flor would part Aling’s hair in the middle and spread them around her face like white uncooked bihon noodle sticks. Flor would open the envelope and look inside. All 135 big and fat Mama lice crawled all over the paper and on each other, each looking for an escape route out of the envelope. Flor would pinch several of them with her forefinger and thumb and carefully plant them on Aling’s waiting scalp. She would feel Aling shiver. After the last louse was planted, Flor would rub some warm coconut oil on her palms. The sweet scent would remind her of bukayo, fried shredded coconut, her favorite snack when she was growing up. Her tongue would venture out and taste the phantom brown sugar on her lips. Section by section, from roots to the end, Flor would drench Aling’s hair with oil. Aling’s brittle hair would turn soft. Julia would dig her fingers and scratch Aling’s scalp. Gently, slowly. Just enough to make Aling sigh. It would be quiet but for Aling’s sighs. And so the hunt would start. Flor would comb all of Aling’s hair away from her neck, exposing her ear and the veins on her neck that quivered as her heart pumped. “I see one,” Flor would announce so Aling could savor the moment when Flor pricked the louse on her scalp. Each prick would send delicious tingles from Aling’s scalp to the soles of her feet, raising little hairs on the back of her neck and arms. They would not stop until every single louse planted had been pricked between Flor’s nails. And in those moments spent suspended between consciousness and sleep, Aling would remember coconut scented summer days with her mother, sisters, and female cousins, sitting on the grass, each absorbed in the task of finding the other’s nits and lice while at the same time enjoying the feel of somebody’s gentle fingers running through her hair, tugging, scratching. And she would forget that her mother was no longer; that her sisters and female cousins, all married and had families of their own, lived far and seldom visited; that she was all alone. Flor would not stop until Aling, with a contented smile on her face, fell asleep. Feeling drowsy, she, too, would lie down next to Aling. She would feel her body sink ever so slowly and, ensconsced between the sheets splotched with coconut oil, she would dream about a time in her life when a simple treat as a packet of bukayo made her happy. (Alright. 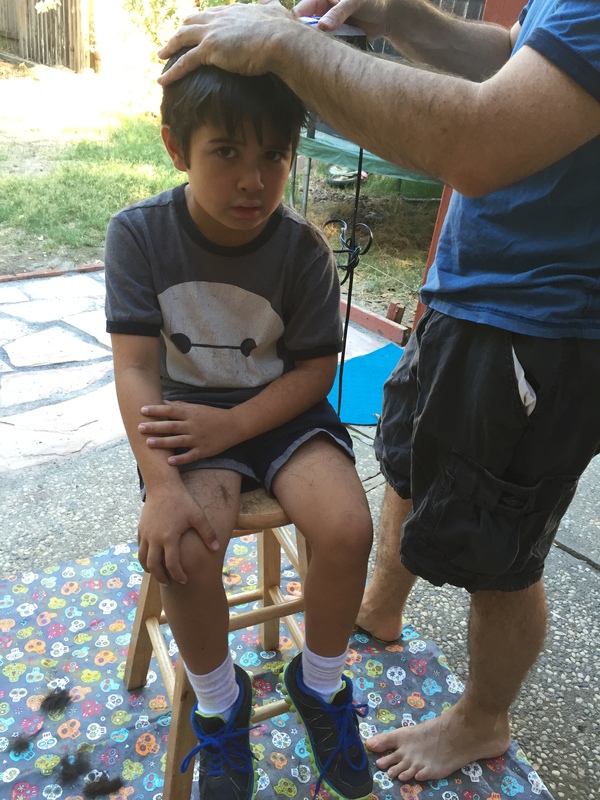 So, yes, we had our first lice infestation two weeks ago. 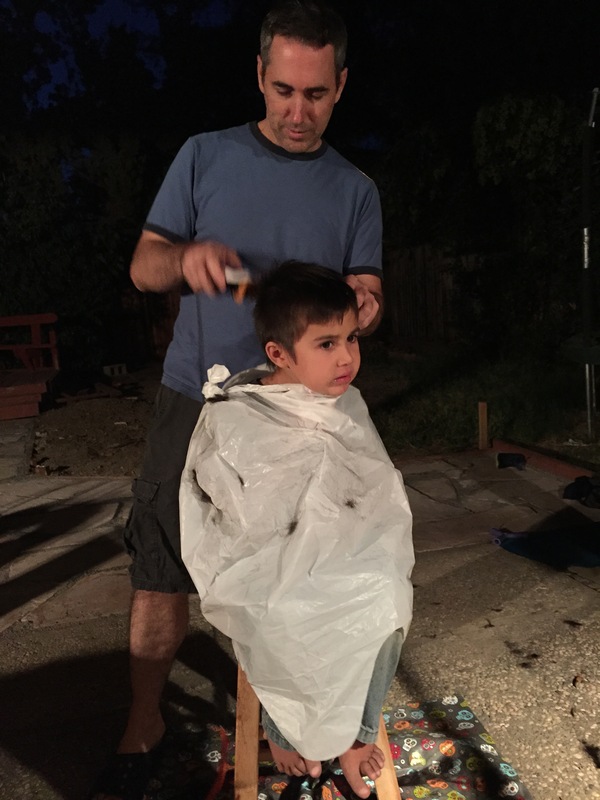 Your Papa was forced to take out his clippers and cut your hair because, according to one haircut lady who looked at me like I was crazy when I told her you had lice, “CA law states that professional barbers/haircutters can not touch lice infested hair!! !” Just as well because now your Papa has discovered that there’s nothing to clipping your hair! He’s decided he will cut your hair from now on instead of paying somebody $15.00 for each haircut. But really, the best part about this is that you both now willingly lie down on my lap for at least half an hour so I could pick nits from your hair. Even when you both are already lice free, I pretend I still have to check to make sure all the nits are really gone. My days of being able to hold you, keep you still on my lap, are numbered so I’m taking every opportunity to do it. Love you guys, lice and all!